LaserPro Mercury mdl. L-30 30Watt Laser Engraver w/ Digital Controls, 18” x 25” Work Area, Vacuum Pump and Blower. TSS Engine Run Stand Co. Folding Run Stand w/ Fuel and Coolant Tanks. North American Cutting and Coiling mdl. NA935 Hose Cutting and Coiling Machine s/n 551 w/ Digital Controls. (2) BlueM POM7-206C- 3 343 Dec C / 650 Deg F Industrial Ovens. Dayton mdl. 57632A 10Hp Horizontal Air Compressor w/ 120 Gallon Tank. 5Hp Horizontal Air Compressor w/ 60 Gallon Tank. Large Quantity of Hardware (Ace Hardware Buyout) Electrical Fixtures and Conduit, PVC, Copper and Brass Plumbing, Nuts, Bolts, Screws and Aftermarket Automotive Products w/ Store Display Shelving. Brown &Sharpe “Gage 2000” CMM Machine s/n 0801-1637 w/ Brown &amp; Sharpe Digital Controls, Renishaw MIP Probe Head. Heins Balancing Machines mdl. 80 23 6 Precision Balancing Machine s/n 8025G-772 w/ Left and Right positions. Heins Balancing Machines mdl. FN-100 Precision Balancing Machine s/n 8025-556. Heins Balancing Machines mdl. 1S Balancer Test Fixture s/n 4656X14. Scherr Tumico 22-1500 Series 14” Optical Comparator w/ Scherr Tumico DRO. MicroVu mdl. M-14 14” Floor Model Optical Comprator w/ Acu-Rite II DRO, Surface and Profile Illumination. Federal mdl. 130B-23 Electronic Gage Millionths Comparator s/n 1505. SA Ateq F Pressure Tester. (6) 40’ and 20’ Storage Containers. Clark and Windsor Industrial Floor Scrubbers. LeMond a-force- RT Recumbent Bike. DEC/2011 Viper VT-25BCNC Turning Center s/n 4331109012 w/ Fanuc Series 0i-TD Controls, 12-Station Turret, 3500 RPM, Hydraulic Tailstock, 10”3-Jaw Power Chuck, Chip Conveyor, Coolant. NOV/2011 Viper VT-25BCNC Turning Center s/n 4331109011 w/ Fanuc Series 0i-TD Controls, 12-Station Turret, 3500 RPM, Hydraulic Tailstock, 10”3-Jaw Power Chuck, Chip Conveyor, Coolant. DEC/2010 Viper VT-25BCNC Turning Center s/n 4331011012 w/ Fanuc Series 0i-TD Controls, 12-Station Turret, 3500 RPM, Hydraulic Tailstock, 10”3-Jaw Power Chuck, Chip Conveyor, Coolant. DEC/2010 Viper VT-25BCNC Turning Center s/n 4331011011 w/ Fanuc Series 0i-TD Controls, 12-Station Turret, 3500 RPM, Hydraulic Tailstock, 10”3-Jaw Power Chuck, Chip Conveyor, Coolant. 2008 YCM TC-36 CNC Turning Center s/n 0060 w/ Yeong Chin Fanuc TXP-200e Controls, 12-Station Turret, 2500 RPM, Hydraulic Tailstock, 23.2” Max Turning Dia, 46.81” Max Turning Length, 58.74”Between Centers, 12” 3-Jaw Power Chuck, Chip Conveyor, Coolant. OCT/2007 YCM TC-36W CNC Turning Center s/n 0082 w/ Yeong Chin Fanuc TXP-200e Controls, 12-Station Turret, 2500 RPM, Hydraulic Tailstock, 23.2” Max Turning Dia, 23.7” Max Turning Length, 36.41” Between Centers, 12” 3-Jaw Power Chuck, Chip Conveyor, Coolant. (3) CHC Enhancements AutoBar-400 Automatic Bar Loader / Feeders. 2006 Mori Seiki NH5000/40DCG 2-Pallet 4-Axis CNC Horizontal Machining Center s/n NH502FG0041 w/Mori Seiki MSX-701 III Controls, Hand Wheel, 60-Station ATC, CAT-40 Taper Spindle, 4 th Axis Thru Pallets, (2) 19 ¾” x 19 ¾” Pallets, Chip Conveyor, Coolant. Kitamura MyCenter H-500 2-Pallet 4-Axis CNC Horizontal Machining Center s/n 43064 w/ Fanuc Series 15-M Controls, Hand Wheel, 120-Station ATC, CAT-50 Taper Spindle, 4 th Axis Thru Pallets, (2) 19 ¾” x 19¾” Pallets, Chip Augers and Conveyor, Coolant. 2004 Haas VF-5B/40 4-Axis CNC Vertical Machining Center s/n 36848 w/ Haas Controls, Hand Wheel, 40-Station Side Mount ATC, CAT-40 Taper Spindle, 10,000 RPM, 30Hp 2-Speed Gear Drive, Haas VOP-C, Rigid Tapping, Coordinate Rotation and Scaling, M19 Spindle Orientation P &R Codes, Quick Code, Programmable Coolant Spigot, 23” x 52” Table, Chip Auger, Floppy Disc, Coolant. 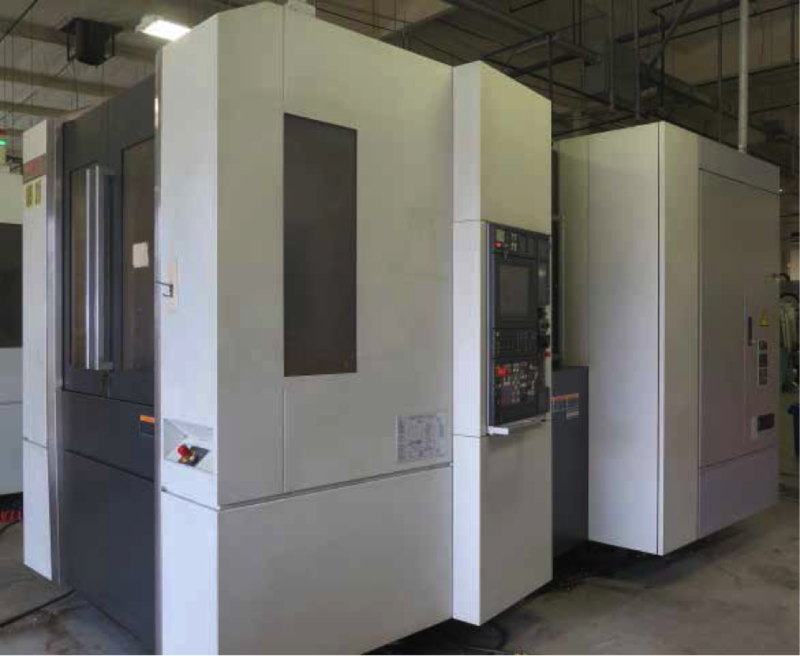 2004 Haas VF-5B/40 4-Axis CNC Vertical Machining Center s/n 33914 w/ Haas Controls, Hand Wheel, 40-Station Side Mount ATC, CAT-40 Taper Spindle, 10,000 RPM, 30Hp 2-Speed Gear Drive, Haas VOP-C,Rigid Tapping, Coordinate Rotation and Scaling, M19 Spindle Orientation P & R Codes, Macros, Quick Code, Programmable Coolant Spigot, 23” x 52” Table, Chip Auger, Floppy Disc, Coolant. 2004 Haas VF-4D 4-Axis CNC Vertical Machining Center s/n 35463 w/ Haas Controls, Hand Wheel, 24-Station ATC, CAT-40 Taper Spindle, 7500 RPM, 20Hp Vector Dual Drive, Baldor Spindle Motor, Brush 4 th Axis, Rigid Tapping, Coordinate Rotation and Scaling, M19 Spindle Orientation P &R Codes, Macros, 20-Position Coolant Spigot, 8mm Pitch Ball Screws, 208/230V, Floppy Disc, 18” x 52” Table, Chip Auger, Coolant. (6) 2001 Supermax FV56A 2-Pallet CNC Vertical Machining Center s/n 011203 w/ Fanuc Series 18-M Controls, 20-Station ATC, CAT-40 Taper Spindle, Hand Wheel, Harbor Oil Cooler, 16” x 22” Pallets, High Flow Coolant. (2) 2001 Supermax FV56A 2-Pallet CNC Vertical Machining Center s/n 010187 w/ Fanuc Series 18-M Controls, 20-Station ATC, CAT-40 Taper Spindle, Hand Wheel, Harbor Oil Cooler, 16” x 22” Pallets, High Flow Coolant, Chip Conveyor. (1) 2000 Supermax FV56A 2-Pallet CNC Vertical Machining Center s/n 005109 w/ Fanuc Series 18-M,Controls, 20-Station ATC, CAT-40 Taper Spindle, Hand Wheel, Harbor Oil Cooler, 16” x 22” Pallets, Coolant, Chip Conveyor. (5) 2000 Supermax FV56A 2-Pallet CNC Vertical Machining Center s/n 005096 w/ Fanuc Series 18-M Controls, 20-Station ATC, CAT-40 Taper Spindle, Hand Wheel, Harbor Oil Cooler, 16” x 22” Pallets, Coolant. (3) 2000 Supermax FV56A 2-Pallet CNC Vertical Machining Center s/n 005095 w/ Fanuc Series 18-M Controls, 20-Station ATC, CAT-40 Taper Spindle, Hand Wheel, Harbor Oil Cooler, 16” x 22” Pallets, Coolant. 2000 Goshen Rubber Central Engineering mdl. 663T PRESS Hydraulic Rubber Compression Molding Machine s/n P00044 w/ 32” x 36 ¾” Heated Platens. WCRM West Coast Rubber Machinery mdl. 18PH23-22 Hydraulic Rubber Compression Molding Machine s/n 01027 w/ 18,000 Watt Heater, 24” x 24” Platens. PHI mdl. P215C Hydraulic Rubber Compression Molding Machine (NEEDS REPAIR). Crowe Performer mdl. ACFP 14/25 Rubber Extruding Machine s/n 3502-29- 85-00 w/ Crowe Controls, 14100 cm3 Max Extrusion Volume, 800mm Extrusion Stroke, 500Kn Extrusion Force. Farrel Rubber Mill s/n 58A1010 (Rebuilt) w/ 10” x 6 ½” Dia. Rolls. Beverly Shear 27” Rubber Slitter s/n MSS-30. Colonial Broach mdl. VBS-10- 42 42” Hydraulic Vertical Broaching Machine s/n M-4607 w/ 20” x 22” Table, Coolant. American Broach Machine mdl. T-4- 24 24” Hydraulic Vertical Broaching Machine s/n 3875 w/ 4-Ton Normal Capacity, 14” x 17” Table. Pioneer mdl. VM-215- 3 Draw Type Hydraulic Broaching Machine s/n A-1132 w/ 11 ½” x 11 ½” Table. Advanced Hydraulics mcl. CPB-5- E 5-Ton Cap Hydraulic Press. Advanced Hydraulics mdl. CPB-2- E 2-Ton Cap Hydraulic Press. Denison Multipress 1-Ton Cap Hydraulic Press. ITT Jabsco mdl. 1-HP- 108 Hydraulic Press. Nugier mdl. H40-7 40 Ton Sliding Ram Hydraulic H-Frame Press s/n 6152029. Atlas No. 3 Arbor Press w/ Stand. Timesavers mdl. 1211-12- 0 24” Belt Grainer s/n 29913. Heald No. 22 16” Rotary Surface Grinder s/n DPC-E- 151 -CONT- DET-1J w/ 16” Magnetic Chuck. 1998 Ganesh mdl. G-618 6” x 18” Surface Grinder s/n 1512 w/ Wheel Dresser, Magnetic Chuck. Reid mdl. 618H 6” x 18” Surface Grinder s/n 11534 w/ Magnetic Chuck. Acra Kong Kuang mdl. RS-612 6” x 12” Surface Grinder s/n 612012 w/ Magnetic Chuck. Superior Hone mdl. HMS Honing Machine s/n 0974-002. Torit 4-Element Dust Collector w/ Torit Checker Board Digital Controls. Torit mdl. VS1500 Dust Collector. Cat mdl. C-5 Water-Filtered Dust Collector s/n 549. (7) Fellows Type 6 Gear Shapers w/ 18” Dia. Table. (6) Fellows Type 7 and 7A Gear Shapers w/ 8” Dia. Table. (2) Drummond Maxi-Cut Type 2A Gear Shapers w/ 8” x 2” Cap. (4) Fellows Type 3PF and 3GS Fine Pitch Gear Shapers. Barber Colman 16-36 16” x 36” Gear Hobber. (2) Barber Colman No. 6-10 6” x 10” Gear Hobbers s/n’s 4156, 2596R. (2) Barber Colman No. 3 Gear Hobbers s/n’s 2222, 2030. Barber Colman Hob Sharpener s/n 302 w/ Wheel Dresser. Barber Colman No. 3 Hob Sharpener s/n 714. Victor 1640 16” x 40” Geared Head Gap Bed Lathe s/n 56238 w/ Trak DRO, 65-1800 RPM, Inch/mm Threading, Tailstock, KDK Tool Post, 10” 3-Jaw Chuck. Namseon Acra Turn 16” x 40” Geared Head Gap Bed Lathe s/n N1-85010392 w/ 23-1800 RPM, Inch/mm Threading, Tailstock, Trava-Dial, KDK Tool Post, 10” 3-Jaw Chuck, Coolant. Tailstock, Mack Tool Post, 10” 3-Jaw Chuck. Clausing 12” x 34” Lathe w/ Taper Attachment, Tailstock, 5C Collet Closer, Tool Post. Turret, Power Feeds, 5C Collet Closer, Coolant. Hardinge DSM-59 Second OP Lathe s/n DV-59- 11475 w/ 150-3000 RPM, Cross Slide, 5C Collet Closer. Hardinge mdl. DSM-59 Second OP Lathe w/ Adjustable RPM, 5C Collet Closer. Hardinge DV-59 Second OP Lathe w/ 230-3500 RPM, Cross Slide, Cutoff Attachment, 5C Collet Closer. (2) Hardinge HSL Speed Lathes w/ 3-Speeds, 5C Pneumatic Collet Closer. Ramco Second OP Lathe s/n 683917 w/ 400-1600 RPM, 4-Speeds, Colleted Spindle. Bridgeport Series II Special Vertical Mill s/n 49853 w/ Anilam Wizard DRO, 60-4200 Dial RPM, Kurt Power Draw-Bar, Chrome Box Ways, Power Feed, 11” x 58” Table. Webb Vertical Mill w/ Mitutoyo DRO, 3Hp Motor, 60-4200 Dial RPM, Chrome Ways, Power Feed, 9” x42” Table.